At first, this seemed like a win-win read for me. 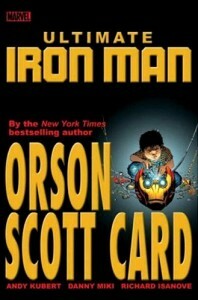 It’s Orson Scott Card, who I genuinely think is a good writer (although I have less and less respect for him as a person), and it’s in one of those parallel universes so I don’t really have to know anything about Iron Man cannon to enjoy it. I also (mistakenly) assumed that a relatively thick, hardcover collection would contain a whole story… but no, this ends with a cliffhanger. I did really enjoy about the first half of the book, as I dug the blue armor stuff, and got into seeing the young Tony Stark interact with a young James Rhodes at prep school, but I couldn’t believe how dark the story got when Obadiah was introduced. Right off the bat he’s killing other children and plotting against Tony. It was relatively disturbing. So by the time I got to the end of the book, I was ready to be done with it. But then the story doesn’t end. I haven’t decided if I’ll read the rest of the series. I’ve seen Ultimate Iron Man II on the shelves, and I’ll admit if this had been better, I’d be tempted, but based my level of enjoyment here, I’ll probably hold out for library copies of the whole series. This entry was posted by Martin	on Sunday, May 18th, 2008 at 6:51 pm and is filed under Marvel, TPBs/graphic novels. You can follow any responses to this entry through the RSS 2.0 feed. You can leave a response, or trackback from your own site.